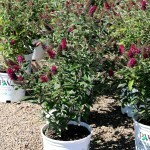 It is a sterile butterfly bush with bright red-fuchsia, fragrant summer blooms that attracts butterflies and hummingbirds. It flowers on new wood, something to consider when pruning. 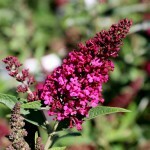 It has a compact, well-branched form, idea for smaller gardens and mixed borders. It prefers full sun and average, well-drained soils.